Born in Changchun, China, Zhang spent his formative years in the sixties and seventies under Mao Tse Tung’s regime. Zhang’s was the first generation after the Cultural Revolution (1966-1976) to receive a formal art education, and in 1985 he graduated from LuXun Academy of Fine Art. Curiosity about the West and encouragement from his family to further develop his education abroad propelled Zhang in his journey to San Francisco in the early 1990s. Mentored by Peter Voulkos at the Artworks foundry in Berkeley and introduced to the work of other clay artists working in the Bay Area—Stephen de Staebler, Robert Arneson, and Viola Frey—Zhang emerged as a ceramicist shaped by the deep history of the medium in his native china and further influenced by practitioners in clay from his new found home in San Francisco. Clay is the medium in which he has worked for more than three decades. 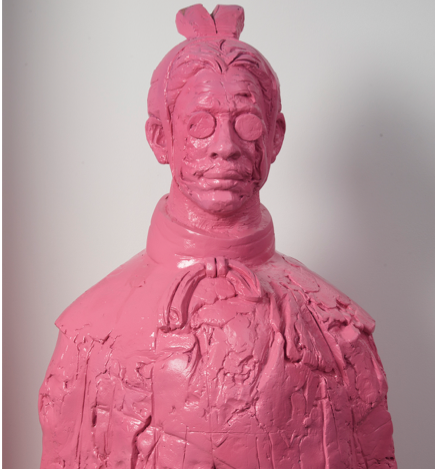 Zhang’s subject matter often reflects the hybridity of his cultural background—Xi’an-era Terracotta Warriors meet Bay Area Figurative and California Funk aesthetics. Made in China (2014), personifies Zhang’s interest in portraying dual cultural references. Painted bubble-gum pink, the life-size figure is at once a warrior from 200 BCE and a riff on the palette of twenty-first century consumer goods. In the exhibition’s attendant publication Deborah Bishop notes “Wanxin Zhang is like a tour guide to the inequity, inhumanity and destabilization that is the current state of the world, as well as its beauty, compassion, and humor….Whatever his topic, Zhang’s references continue to traverse borders, epoch, and disciplines.” Although the Terracotta Warrior remains a motif in Zhang’s art, his recent work reflects a concern with landscape and ecological issues, and the charged and divided politics of this cultural moment in US history—themes evident in the work selected for the MCD exhibit. The exhibition—the first museum solo presentation of Zhang’s work in San Francisco—is accompanied by an illustrated, 80-page publication with an essay by Deborah Bishop, contributions in Chinese by the art historians Du Xiyun and Lu Peng, and a foreword by JoAnn Edwards, Executive Director of the Museum of Craft and Design. Wanxin Zhang: The Long Journey is presented in partnership with the Catharine Clark Gallery and will be on view at the Museum of Craft and Design March 16, 2019 through July 14, 2019. Additional information and high resolution images available here. Wanxin Zhang was born in Changchun, China. His formative years in the 1960s and 70s were under Mao Tse Tung’s regime. After the Cultural Revolution (1966-1976), Zhang attended the LuXun Academy, graduating in 1985. As a young artist, Zhang participated in many avant-garde activities and exhibitions in China including at the National Museum in Beijing. In 1992, after he established his art career in China, he emigrated to the United States where he continued his development and education in the San Francisco Bay Area. He was mentored in his practice by Al Farrow, and by Peter Voulkos, whom he encountered at Artworks Foundry in Berkeley in the early 1990s. He graduated from the Academy of Art University in 1996 with a Master of Fine Arts. Zhang’s sculptures have been reproduced and written about in many publications, most notably Confrontational Ceramics by Judith Schwartz, and Clay in Art by Kostas Tarkasis. His work has been reviewed in Art in America, Sculpture, Ceramics Monthly, Yishu, Journal of Contemporary Chinese Art, and American Ceramics. In 2012 the San Francisco Chronicle selected Zhang’s exhibition at the Richmond Art Center as one of the Top 10 Exhibitions in the San Francisco Bay Area. Further, Zhang’s work has been featured in solo museum exhibitions at the University of Wyoming Art Museum (2006), the Fresno Art Museum in California (2007), the Alden B. Dow Museum of Science and Art in Michigan (2008), and the Arizona State University Museum (2010). His sculptures were included in the 22nd UBC Sculpture Biennial in Japan (2007), the Taipei Ceramics Biennial in Taiwan (2008), the Da Tong City 2nd International Sculpture Biennial in China (2013), and the San Jose Museum of Art in California (2015). In 2017 Zhang’s Disciples were selected for the first AnRen International Art Biennial in Chengdu, China. That same year the Asian Art Museum in San Francisco acquired six clay “brick” works from Zhang’s “Wall” series for the museum’s permanent collection. Zhang lives and works in San Francisco, California, and has been represented by the Catharine Clark Gallery since 2013.